Iron is an essential mineral, used by many enzymes for its ability to trap small molecules like oxygen and to act as a conduit of electron transfer. We get our supply of iron from our diet. The bacteria that inhabit our bodies, however, need to steal their iron from us. Our bodies quickly soak up all the iron we eat and sequester it tightly in proteins that store it and deliver it to our cells. The amount of free iron left for bacteria is vanishingly small, and successful bacteria have to find ways to gather it efficiently. One of the major ways that bacteria gather iron is with siderophores. These are small flexible molecules with a collection of oxygen atoms that surround and trap individual iron atoms. The one shown here is petrobactin. It is built from several small molecules: citrate at the center, two spermidine molecules that form long, flexible linkers, and two unusual molecules of 3,4-dihydroxybenzoic acid (3,4- DHBA) at the two ends of the molecule. Siderophores gather up iron ions when they find them, and specialized transport system delivers the siderophores into the bacterial cells. PSI researchers at MCSG have solved the structure of the part of this transporter that binds to siderophores, shown here from PDB entry 3gfv. Bacteria contain dedicated machinery for building these siderophores. PSI researchers at MCSG have reconstructed this pathway using purified enzymes, and surprisingly shown that the different components may be connected in different orders, all converging to the same petrobactin structure. As part of this work, they have also solved the structure of two of the central enzymes, shown here from PDB entries 3to3 and 3dx5, and clarified how they fit into the entire pathway. 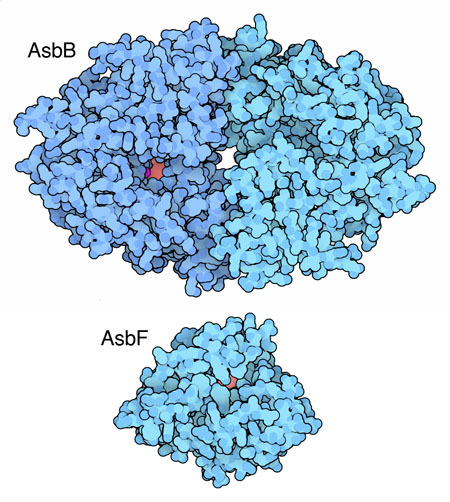 AsbB makes one of the connections between citrate and spermidine, using ATP to power the process. The bacterium encodes two enzymes that perform this type of reaction, AsbA and AsbB, but study of the reconstructed pathway has shown that both are needed for full activity. AsbF builds the unusual benzoic acid ring at the two ends of petrobactin, which is one of the features that makes petrobactin so successful in its job. The bacteria that cause anthrax build two different siderophores, bacillibactin and petrobactin, but petrobactin is the one that's particularly important in virulent infections. 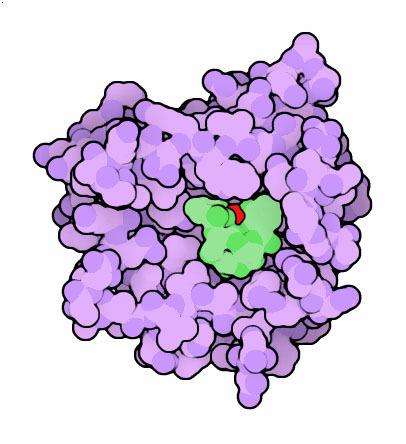 Bacillibactin is less important because we build a special defense protein, siderocalin (shown here from PDB entry 3cmp), that gathers up any bacillibactin that it finds. Petrobactin, on the other hand, has an unusual arrangement of hydroxyl groups on the benzoic acid rings (created by AsbF), and it is not recognized by siderocalin. 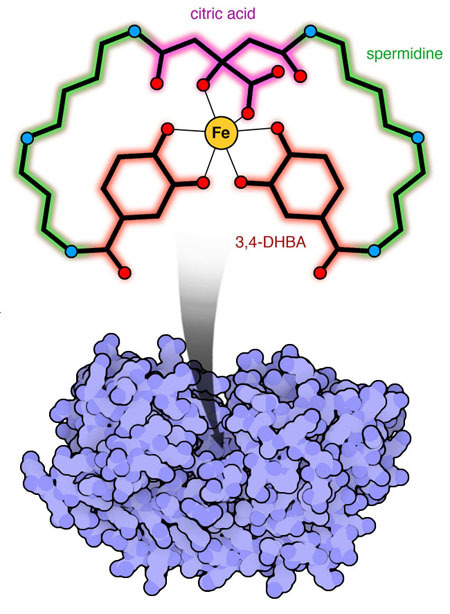 For this reason, petrobactin is a "stealth" siderophore that evades our defenses, and is an important target when designing drugs to fight anthrax infection. AsbB brings together three molecules: spermidine, an intermediate with citrate connected to one spermidine and sometimes the terminal benzoic acid, and ATP. It performs its reaction in two steps: first, it breaks ATP and adds part of it to an acidic group in the intermediate. This activates the intermediate, allowing it to form a new bond with the spermidine, releasing the fragment of ATP. The MCSG structure has ATP bound in one of the two subunits. They have also created a model of how the spermidine and intermediate molecule bind. To take a closer look at this model, the JSmol tab below displays an interactive JSmol. The structure of AsbB includes a magnesium ion (shown in magenta) and ATP (pink) bound in the active site. 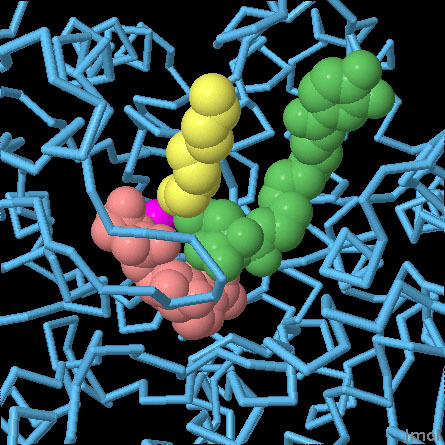 MCSG researchers have also created a model of the other substrates based on this structure, shown here with spermidine in yellow and the spermidine-citrate intermediate in green. Use the buttons to change the colors and representations of the protein and ligands. Hotta, K., Kim, C.-Y., Fox, D. T. & Koppisch, A. T. Siderophore-mediated iron acquisition in Bacillus anthracis and related strains. Microbiology 156, 1918-1925 (2010). 3to3 - Nusca, T. D., et al. Functional and structural analysis of the siderophore synthetase AsbB through reconstruction of the petrobactin biosynthetic pathway from Bacillus anthracis. J. Biol. Chem. in press. 3gfv - Zawadzka, A. M., et al. Characterization of a Bacillus subtilis transporter for petrobactin, an anthrax stealth siderophore. Proc. Natl. Acad. Sci. USA 106, 21854- 21859 (2009).